Black morocco ca. 1700 with gold tooling. Melvin R. Seiden Collection, 2011. This may be the Book of Hours (ex-libris) from the Cortlandt Field Bishop collection, previously in the Engel-Gros library (sale, Paris, 2 June 1921, lot 12) but not included in the Cortlandt Bishop sales of 1938-48; acquired by William Stuart Spaulding, Jr. and his wife Angele Louise Maggi and sold after her death at Sotheby's, London, 6 December 2005, lot 54. 189v: St. Francis receiving the stigmata; 190r: St. Nicholas as a bishop giving money to three maidens; 191r: St. Jerome as a cardinal with his lion; 192r: St. Augustine as a bishop before a child pouring sea into a hole; 193r: The Confessors before the enthroned Christ and Virgin; 194r: St. Mary Madgalen as a penitent emerging from her cave and kneeling before a crucifix; 195v: St. Anne, 'selbdritt' image of the saint with the Virgin and Christ Child; 196v: St. Barbara beside a castle; 197v: St. Catherine with sword and open book; 198v: St. Apollonia in a garden with pincers in her right hand and a tooth in her left; 199v: St. Agatha with pincers clasping her removed breast in her left hand; 200v: St. Agnes in a garden with her lamb; 201v: Assembly of Virgins; 202v: St. Gregory kneeling before a vision of the risen Christ in a chapel; 205v: Christ Child gives His blessing; 208v: Virgin and Child; 212v: Pieta before the Cross; 215r: Crucifixion. Artist: Possibly workshop of the Master of the David Scenes in the Grimani Breviary. See Illuminating the Renaissance: The Triumph of Flemish Manuscript Painting in Europe / Thomas Kren and Scot McKendrick. London: Thames and Hudson, 2003, p. 439-442. 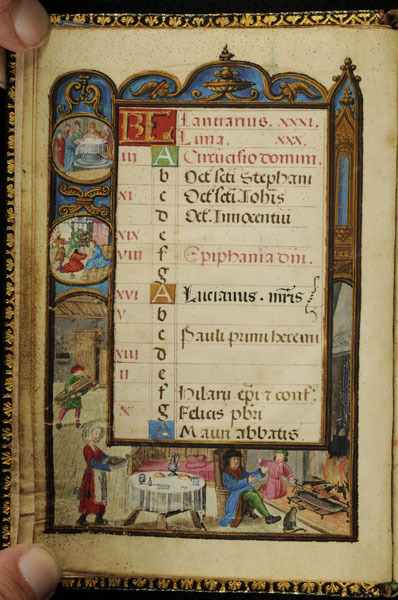 Contents: Calendar (fol. 3v); Gospel Sequences (fol. 17r); Hours of the Virgin (fol. 34r) with seasonal variants added in Spain (fol. 95r); Penitential Psalms (fol. 104r); Office of the Dead (fol. 125r); Suffrages to one's guardian angel (fol. 173r) and to the saints (fol. 175r); Verses of St. Gregory (fol. 202v), a prayer on the Holy Name (fol. 205v), the Obsecro te (fol. 208v) and O intemerata (fol. 212v), the Stabat mater (fol. 215r), and the Athanasian Creed; and, added in Spain, the Hours of the Cross (fol. 223r) and of the Compassion of the Virgin (fol. 233r), ending on fol. 237r. Decoration: 11 full-page miniatures (10 large miniatures within historiated borders); 35 small miniatures (including 2 historiated initials, fols. 34r and 125r); 69 historiated borders. All within architectural frames. List of full-page illustrations: 16v: St. John the Evangelist boiled in oil; 33v: Annunciation; 44v: Visitation; 56v: Nativity; 62v: Circumcision of Christ; 67v: Adoration of the Magi; 72v: Presentation in the Temple; 77v: Massacre of the Innocents; 86v: Assumption of the Virgin; 124v: Funeral Service; 172v: Last Judgement. Ms. book of hours for the use of Rome, written and illuminated in the southern Netherlands (probably Bruges) ca. 1525-1530. Script and illumination on fols. 223-237r is Spanish and probably added in Spain ca. 1530-1550. Small miniatures (including two historiated initials) with text and historiated borders: 17r: St. John the Evangelist writing his Gospel; 18v: Agony in the Garden; 19r: Road to Calvary; 34r: Historiated initial, God sends forth an angel; 94v: Relief with legend, "ad feria tercia et sexta"; 125r: An apothecary at his desk within an historiated initial "D" formed by bones and sculls; 173r: St. Michael with a sword and scales; a man (probably the patron) kneels at a prie-dieu in the border; 175r: St. John the Baptist addressing his lamb; 176r: St. Peter holding his key and book; 177r: St. Paul holding a sword and book; 178r: St. James wearing his pilgrim's hat; 179r: St. Andrew with his X-shaped cross and book; 180r: St. John the Evangelist warding off the devil's poisoned cup; 180v: Apostles including Sts. Peter, Paul and Andrew; 183r: St. Christopher carrying the Christ Child across a river; 184v: St. Sebastian as an archer with longbow and feathered cap; 185v: St. George and the defeated dragon; 187r: St. Erasmus as a bishop; 188v: Martyrs grouped together with St. John the Baptist. The male patron appears on fol. 173r praying before a prie-dieu. Unidentified arms (quarterly, 1 and 4, or a six-pointed star gules, 2 and 3, or 2 chevrons azure) in a lozenge shape (for a woman) appear on a bier on fol. 124v. Written probably for the Spanish market by the scribe of the Munich-Monserrat Hours. See Illuminating the Book: Essays in Honour of Janet Backhouse / Michelle P. Brown and Scot McKendrick eds., Toronto: University of Toronto Press, 1998, p. 209-232.